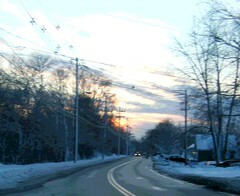 This completes the run of four photos of the winter sunset, all taken on January 16th with my new digital camera. (These photos may not be in chronological order, but I wanted to begin and end with an image of a road.) Like the others in the set, I took this photo from the passenger seat of a car, during a ride from Beverly to Manchester, New Hampshire. So I had to crop the original photo to remove the view of the car's interior, dash, and mirrors. Then I opened the image in Painter IX and posterized it, as I did with the others.